The theme for the latest edition of Nothing More Beautiful is The Church We Believe in is Catholic. To stress the Catholicity, or the universality, of the Church, this episode takes on a bit more of an international flavour. You'll notice flags from a number of countries in the Basilica -- representing the many different nations in the Archdiocese of Edmonton. We also see the prayers of the faithful delivered in a variety of different languages -- from Creole, to Tagalog, to Cantonese. Of course, the most noticeable 'international expression' comes from the speakers. 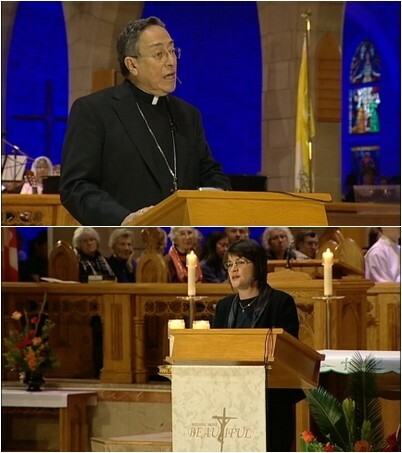 The catechesis talk is given by Cardinal Oscar Rodríguez Maradiaga, SDB. The Honduran prelate is the president of the Catholic international aid collective Caritas Internationalis. The Archbishop of Tegucigalpa is a staunch defender of human rights and a powerful voice in the global fight against poverty. The Salesian was also the Vatican's spokesperson on the issue of Third World debt, and he continues to challenge global leaders to keep their promises to increase and improve development aid to the world's poorest countries. His talks examines the universality of the Church -- that the message of salvation is for all peoples. In a way, he gives a talk on the "theology of Catholicity." He also notes the importance of putting the theology into practice, and says that Caritas Internationalis offers a "concrete form of practicing it." That is what witness speaker Dr. Lesley-Anne Knight discusses. She's Caritas' Secretary General, or CEO. Dr. Knight has had more than 25 years of experience in international development. She has traveled to many nations, seen the joy and suffering of many different people. As she recounts a number of stories -- traveling to Haiti after the devastating earthquake, traveling to Pakistan and meeting with Muslims -- she speaks about our faith as being all embracing, and reaching out to all nations. Tune in for both talks on Nothing More Beautiful: The Church We Believe in Is Catholic this Saturday, February 26th, or Tuesday, March 1st, at 8:00pm ET or 9:00pm PT. Leslie-Anne spoke very movingly of the work of Caritas Internationalis, which seeks in all that it does “to be a sign of God’s all-embracing love for humanity”. The catholicity of the Church reaches its perfect expression in concrete acts of caritas, of love, of a love that, as Leslie-Anne said, reaches across the nations.